Currently, we build three main heights of security poles in the 4″ Square Pole series. They are made out of special Aerospace Aluminum, with this material your pole will have a long lifetime of rust-free life. We back it with a warranty of 20 Years Structural Integrity Warranty (3 Years finish and material warranty-all warranties are limited to replacement and/or repair). The Five-foot tall poles are commonly used for mounting cameras where it is important to be down on the same level as the machine or vehicle that is being monitored. With the optional WallMount Bracket, installing your devices or cameras in any area makes it possible. The Eight-foot tall poles are great for parking lots, pedestrian areas, gates, entry/exit points. This size pole is commonly sold with our tilt over base, to help with maintenance of the devices at the top of the pole. The Twelve-foot tall poles are one of our largest sellers. They are an excellent height for a camera that can do facial recognition, people counting, line crossing, intrusion, motion, etc. All three sizes of poles are available in anodized bronze or powder coat white. Our engineers worked with security installers to manufacturer a “NO-WELD” pole that fits any brand of wireless or wired device. Designed with internal corner tubing shafts molded in for even more strength this design will transfer all loads into the corners, meaning less camera shake in high winds. 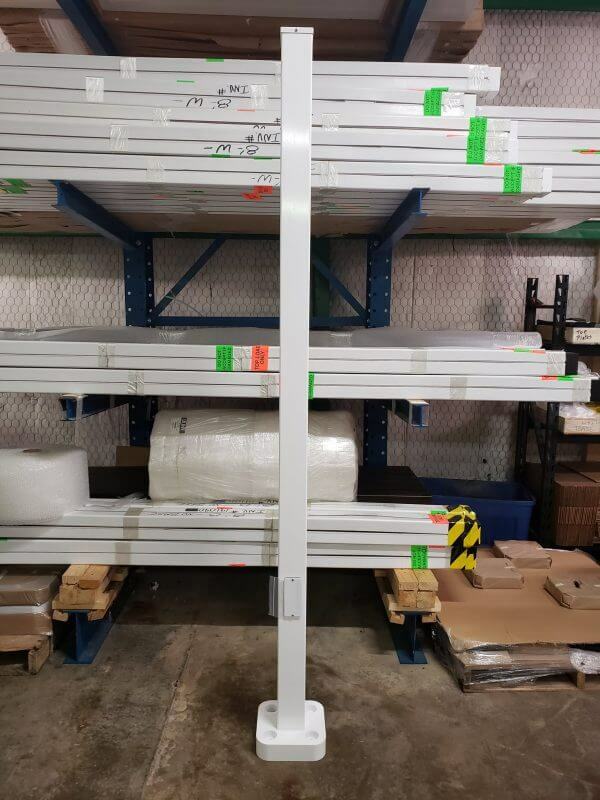 The completely flat 4″ wide faces make mounting cameras, infrared lamps, motion detectors, and any other device quick and easy, with the strength of the pole in the corners, drilling multiple access and bolt holes can be accomplished without worry. For more information on 4″ Classic Camera Poles call a sales engineer here at Strong Poles toll-free 844-669-3537 or stop by our website. This entry was posted in Building Security Surveillance, Camera Poles, Camera Security Poles, Commercial Security Camera Poles, Security Camera Poles, Surveillance Camera Poles and tagged 4" square poles, Security Camera Poles, security poles.